We are in one of the most complex conundrums in financial history. 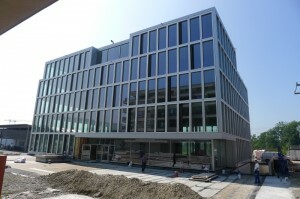 On the one hand we have vast amounts of cash that creates tremendous liquidity with interest rates at virtually zero, G7 finance ministers at least alarmed about the high level of liquidity yet it is becoming obvious even to them that monetary policy can not solve the structural problems in Europe or the world economy for that matter. The longer this period of excessively low interest rates prevails, the greater the risk of a total confusing global economic meltdown. Even the U.S. Federal Reserve is now worried what will happen when interest rates start to rise. The banks have been buying risky assets and trading with free money. A rise in interest rates could be catastrophic since these people assume whatever trend is in motion will stay in motion. But the low US interest rates has created a giant short dollar bubble on a global scale never seen before at this level. Banks have been selling loans around the world in dollars as a way to lower interest rate costs. Many third world governments have been issuing debt in dollars. 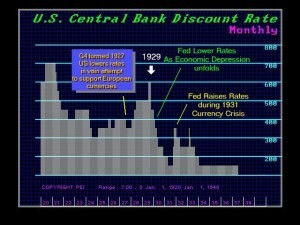 This is where old theories are collapsing because the dollar has emerged more than a mere reserve currency, but as THE international currency given the structural problems with the Euro and the lack of the Yen to ever graduate to a serious currency given all the strings and controls attached to it by the government. You could not even issue a yen bond in London without Minister of Finance (MOF) approval in Tokyo. It is also becoming obvious that interest rates cannot be kept at such a low level. This is causing pension funds and even the Social Security system to move deeper into insolvency. Without interest rates at normal levels, pension funds that were “conservative” are broke. States like Pennsylvania didn’t bother to even fund their pensions for the last 5 years. The Fed will ultimately try to sell its portfolio of U.S. government bonds and what will they do when they see the losses that they will take as rates rise? The realization that the expansion of the money supply by the Fed has failed to create inflation has befuddled every standard domestic economic theory. They have failed to graduate to the global level where they must realize that the dollar has emerged as a international currency going beyond a mere reserve currency becoming the currency of choice since there is no rational alternative. 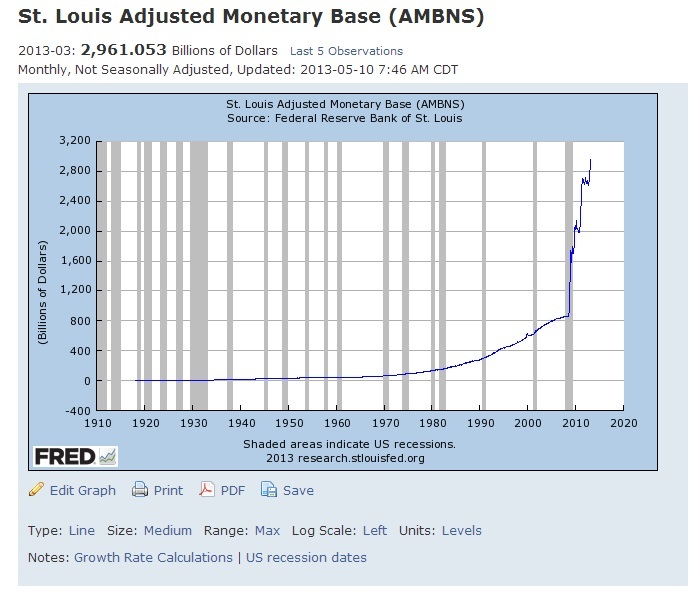 The expansion of the money supply by the Fed has been absorbed globally. The idea of stimulating through purchasing government bonds that in theory would put money into the system has failed to comprehend that 40% of the bonds are held by foreign entities. Thus, the old theories are just antiquated and have led to a massive level delusion everywhere from economics, share markets, gold, to interest rates. Interest rates under domestic theory will have to rise to save pension funds. The Fed will not see the global implications and the huge dollar shorts and a rise in rates will spark a massive short-cover rally in the dollar. With the German elections looking more perilous by the day come September, the future going into 2016 could be a massive rally in the dollar coupled with rally in the Dow Jones Industrials that could reach 17330, 18900, or 23,388 by 2015.75. If the central bankers screw it up as usual, they could create a Japanese type bubble on this one. With the ECB and the Bank of Japan have strengthened their money printing activities. the Fed may raise rates out of concern. The ECB could cut interest rates again soon and the Fed may try to help the Euro by raising rates thinking that will help Europe reverse of what they did in 1927 cutting US rates to deflect capital back to Europe. At the G7 meeting, all participants tried to emphasize that there should be no currency war. This is just talk because they immediate thereafter did their own thing. Indeed, there has been something of a global money printing by the coordinated policy, which is a unspoken secret and manipulative activity of the central bankers. For large international investors, the situation is getting confusing to say the least. the number of inquiries we are getting are starting to rise exponentially. The central banks have no choice but to diversify buying stocks themselves and this is coming full circle since the way the Fed was originally designed was to buy corporate paper not government. It is true that central banks are unable to control either the global economy or the money supply. The liquidity again may lead to large-scale asset inflation as capital also flees from government debt especially in Europe. If the Fed raises interest rates, there is an acute risk associated with the trading banks in New York as always. However, with the ECB policy of bail-ins taking depositor’s money to bail out the banks that are suffering from bad Euro bonds, there is simultaneously the massive risk of deflation emerging with massive loss of value in existing assets in Europe. This can only send more capital fleeing into the dollar. No doubt, there is tremendous confusion, bewilderment, and outright nervousness among central bankers around the globe. Frantic efforts of Europeans determined to hold on to the Euro without structural reforms has many clambering to changed rules of the game overnight. The Fed is also looking at imposing restrictive measures on bankers but gradually to prevent shock. There is no appetite to write a check again to the NY Bankers. So caution is being taken. They realize that an increase in interest rates would send a shock wave through the bond market and hit the banks hard raising their cost of funds. However, the pension funds are going broke at this level. Europe debt issued are off the charts. Almost everywhere, massive capital flight is a serious risk the politicians do not understand. The contradictory statements of the central planners do not increase at a heightened confidence in the least. All that emerges is hope that seems to triumph over experience. The average European without yachts, is looking a continued rising unemployment and negative economic growth rates. The youth have not future and even 50% of the French youth want to leave France. Politicians are living in the past. Marxism is dead. The youth have listened to this nonsense of taxing the rich but they fail to see how this ever benefits them or anyone other than government. Indeed, Socialism is killing the economy in Europe. Switzerland is beginning to consider limiting the number of EU citizens who can work there, Recent Gallup polls show an unimaginable 150 million people would like to migrate to the USA. This is getting completely nuts. What will it take to get through to these politicians that Marx is dead. We need a new Global Economic Summit. There is no future going in this direction. Particularly affected are the pension funds in Europe & USA not to mention Japan. The next financial crisis will not be solved by more government bailouts or bail-ins. We are at that point of no return where only a full blown structural reform is possible with a full understanding how the world economy has changed and evolved. This is the entire purpose of establishing the first INTERNATIONAL THINK TANK with participation worldwide. This will not be linked to any single government or political agenda other than bottom line economic survival. We will be opening up to international membership and publications on a global scale of trends. The advisory board will consist of people only with real live experience to create a synergy for solutions. It is time to update the real world.